Did you know that Forever Green Day is this Wednesday, October 6th? Forever Green Day is a day specifically dedicated to celebrating the sisterhood of Girl Scouts and acknowledging that once you’re a Girl Scout, you’re always a Girl Scout. Girl Scouts has played an important role in the lives of many girls nationwide. We love hearing about the amazing things that Girl Scouts has done for girls, such as teaching them valuable skills, giving them incredible opportunities, creating lifelong memories, and letting them earn prestigious awards. Send us your Girl Scout stories by emailing us at marcomm@girlscoutshcc.org or if you’ve earned your Girl Scout Gold Award and would like to tell us about it click here. The color green is obviously very symbolic to Girl Scouts, so the GSHCC Program Center plans to celebrate Forever Green Day by wearing green clothing and even eating green-colored food on October 6th! Be sure to let us know how you plan to celebrate Girl Scouts on Forever Green Day by leaving a comment or sending us an email at marcomm@girlscoutshcc.org. 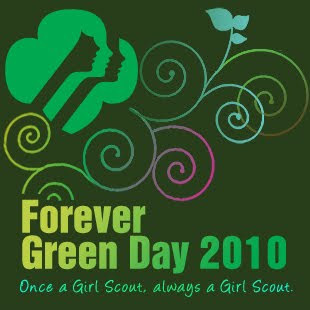 Follow our Forever Green Day 2010 countdown on Facebook (click here to view our fan page) and be sure to make your Facebook status about Forever Green Day as a way to show your Girl Scout pride and remind others about the special day.